FIFA 19 doesn’t rewrite the fundamentals that make its on-field action and myriad modes so addictive, but then again, it doesn’t need to. We’re now in the era of small adjustments and mechanical improvement and the latest entry does just that. Active Touch, Timed Finishes and Dynamic Tactics all riff on the flow of the virtual beautiful game, providing a subtle balance that doesn’t punish casual users or hinder veterans who want a little more complexity. This year’s instalment in EA’s long-running football simulator was always going to have its work cut out following FIFA 18. The fundamental changes to player animation and the improvements across everything from FUT (FIFA Ultimate Team) to Kick-Off mode gave the series a synergy it had lacked in FIFA 17, and finally helped it address the mechanical depth PES had always dominated in. So in that regard, FIFA 19 isn’t some radical rewrite of the franchise you know and love. It’s more a series of subtle tweaks and additions that don’t overhaul the flow of on-field play or the way its myriad modes intertwine but enhance and improve the features that make FIFA such a hit among casual players and veteran pros. First-touches are now much more unpredictable, even when the pitch and ball are dry. So what’s new in this year’s instalment? EA Canada continues to make the most of the power offered by DICE’s Frostbite engine and the personality of the Real Player Motion system (where a number of pro players move and react with the behaviours of their real-life namesakes) with the introduction of Active Touch, Timed Finishes and other little tweaks. The former changes the physics of the ball, which, as you can imagine, has a considerable effect on everything from trapping the ball to how that stylised sphere reacts to a first touch. Now the reaction of your input, the momentum your player is moving with and the combination of their stats all play in part deciding how the ball reacts in a given situation. When combined with the new adjustments to 50/50 Battles - which has now been updated to take into account player size, stats and user input timing - and there’s a greater sense of fluidity to moment-to-moment play. It’s a new balance that really rewards greater intricacy with feints, traps and step-overs, but does so without making the game feel any less approachable. It simply adds a tactical nuance that gives intermediate and Pro level players far more options. That extends to the new Timed Finishes mechanic, which adds a second chance to improve the accuracy and power of any shot on goal. By pressing shoot a second time - just as you strike the ball - you can give a risky shot a greater chance of success, but you can also scuff a much cleaner hit if you mistime your press. It’s certainly more of an arcade element, but it’s got a tiny margin for error so you’ll need to master the timing under pressure before it can really be taken advantage of. The Journey: Champions marks Alex Hunter's final chapter, but it's easily the best entry yet. The Journey returns for its third and final instalment with The Journey: Champions. From FIFA 17 to now, we’ve followed Alex Hunter from rookie status to burgeoning international superstar and this latest chapter. It’s by far the biggest entry yet - clocking in at around 10-12 hours - with separate stories for Alex, his half-sister Kim and long-time friend Danny Williams. In fact, with so many matches and training sessions, we’d go as far as saying it’s a little bloated in places. With plenty of matches, training drills and narrative-driven choices, this glitzy story mode has finally become a proper rival to NBA 2K’s own Career mode experience. The focus on Kim and her continued growth as a young female pro remains a highlight for FIFA 19, and we hope EA Canada keeps giving women’s football the platform it deserves. FIFA Ultimate Team is also back, as always, and it’s jam-packed with all the online-driven bells and whistles to keep you invested in the long-term. 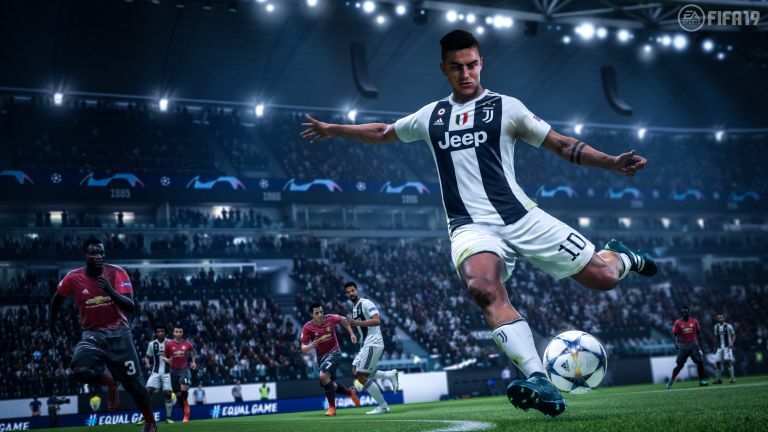 It’s still riddled with microtransactions - and FUT coins are still drip-fed at a glacial pace - but the developer has made the effort to re-approach how online play is structured. You can now play in Divisions, which enables you to compete against other FUT users in leagues specifically tailored to certain skill levels. It’s a far fairer system, and while it’ll take them grinding to make it into higher Divisions, FUT is all about long-term play so it’s hardly that much of an issue. The quick pick-up-and-play world of Kick-Off mode has also been given a welcome airing out with the introduction of the new House Rules. Now you can completely customise rules and stipulations, effectively enabling you to create your very own indoor soccer or FIFA Street-style setup where skill and trick moves are everything. If you love sitting down on the sofa with friends and playing something that’s far less about simulation and real-life rules, this is the mode for you. FIFA Ultimate Team is still as intuitive and addictive as it's always been, including all those microtransactions. FIFA 19 might not be a grand reinvention of the series, but it’s far from a stale, by-the-numbers entry either. The Active Touch system adds a breath of fresh air to minute-to-minute and rewards those looking to showcase their creative flair with the ball. Battles for possession are now a lot tougher, and will force you to be more aggressive. Timed Finishes take a little while to master, and while it’s a very arcadey-element to add to a game geared towards simulation, it provides another tactical layer to shooting. The Journey finally feels like a proper story mode, and it’s easily the best narrative-driven sports mode in EA’s wide locker of titles. EA Canada has addressed concerns with the short length of last year’s instalment, but in doing so it’s made Champions feel bloated and over-long. Still, the renewed focus on Kim Hunter gives women’s football a much bigger part to play, and FIFA 19 is better for it. Add in that long sought-after Champions League licence in all its glory, and you’ve got another full-bodied footie sim that once again leaves PES for dust. Shadow of the Tomb Raider review: is Lara's latest adventure a hidden treasure or a broken relic?